in 2013 I was privileged to attend a screening of The Brass Teapot and interview its director and co-writer, Ramaa Mosley. Now she has a new film, Lost Child out and that gave me the opportunity to catch up with this very talented woman. TailSlate – Nearly six years ago, I interviewed you about the upcoming release of The Brass Teapot. One of the questions was; excluding movies you were involved with, what is your favorite film of all time. Your response was Close Encounters. Is it still your all-time favorite? Ramaa Mosley – Yes! Close Encounters is still one of my all time favorites. And Arrival blew me away. Since Brass Teapot came out in 2013, I’ve been writing and going deeper to figure out what stories I wanted to (and could) tell next. I love sci-fi and supernatural stories but those types of films can be difficult to make on a micro budget. So with Lost Child I turned towards drama as a way to simplify and streamline. TS – Before we discuss The Lost Child, please talk about your involvement with Women for the Win in last year’s election cycle. RM – During the Kavanaugh hearings I was so angry. In a moment of fury I posted on social media that I would direct a free commercial for a progressive, female candidate running for office. Within hours that post had been shared with thousands of people and I was flooded with amazing candidates around the US who needed commercials. I also received hundreds of donations offers from other directors, crew and equipment houses offering their services. I was absolutely blown away. The mid terms were weeks away and I had to move quickly. It was a really intense but rewarding form of activism and we are now gearing up for 2020. TS – You wrote, “We wrote a script because we were tired of waiting for permission from Hollywood. We were depressed, desperate and filled with a madness that pushed us to make a film together by any means possible” about how you came to make Lost Child. Can you expand on that, please? RM – After Brass Teapot, I was ready to make my next film. I was waiting for the studios to discover me but nothing happened… it was utterly quiet. Just crickets. I had a few films that came close to going into production and then they stalled out. I was becoming increasingly depressed. Finally, my husband said, “I just listened on the radio to the Duplass brothers talking about making their films for 20k at their family home. Stop waiting. Let’s just go make your film.” And that ignited this flame in me. I had a new vision of how I could make a film. So I reached out to my writing partner Tim Macy and we sat down and wrote a script in 5 weeks. We set it in the Ozarks because his family is from there. I flew out and started prepping and within 8 weeks we were making our 2nd movie. My husband and his dad were our production designers, my dear friend Darin Moran DP’d and Gina Resnick came on board and produced. TS – How did you find Landon Edwards? He was amazing! RM – Our casting directors were traveling all over the Ozarks and held auditions at various schools. Landon had never acted before but his mother Lisa thought he might enjoying the audition. Landon was 9 years old and loved to climb trees. He is very empathetic and expressive. When I saw Landon, I immediately felt that we could work together. TS – I felt that the use of local talent you found in the Ozarks added to the movie’s “authenticity.” Was that a deliberate choice? RM – It was a deliberate choice to use local people. In many ways we were making a narrative feature and using documentary tools. I felt that it was more likely that I could direct real people to embody the characters. It became this time of improvisational, yet crafted process. TS – Leven Ramblin is a very beautiful woman. It seemed that there was a serious effort to, for lack of a better term, unglam her for the movie. Was that difficult? RM – Very true. 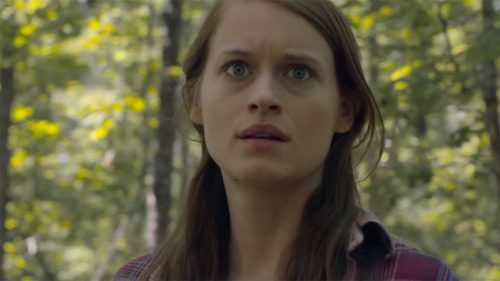 Leven agreed that we needed to change her physical appearance so that audiences would believe her. She spent a great deal of time preparing physically for the role. Changing her hair color was one effective way that she moved into the character superficially. This allowed her to embody “Fern”. The other way was her wardrobe. Selecting baggy clothes – denim, long shirts, created a sense of defensive protection. TS – Was making “Mike” a social worker who moonlights as a bartender “commentary” on how poorly society pays and values people who take on that difficult work? RM – I like that interpretation. The character of Mike is based loosely in my co-writer’s father. During our time researching social workers we learned that many do have second jobs to pay the bills. I set out to make a female driven western. The setting of the bar allowed us to convey fern’s alcoholism. TS – A lot of work went into the exterior shots in Lost Child. Can you tell us what that was like? RM – The woods create a strong sense of place and are an additional character in the movie. We scheduled our days so that all interiors were shot mid day and exteriors were shot at sunset and dusk. The approach was very naturalistic but the light was magical. This was by design and necessity. We had 12 people on our crew. Additionally, we had no lights to do night scenes. So my DP and I came up with this plan to shoot day for night. It wasn’t ideal but it wasn’t realistic to shoot with a 9 year old child at night in the woods for a week. TS – What’s next for you? RM – I’ve written three screenplays this last two year and I’m really excited to make one or more of them in 2019.